I selected curly endive as my base salad green but you can also use lettuce or baby spinach. 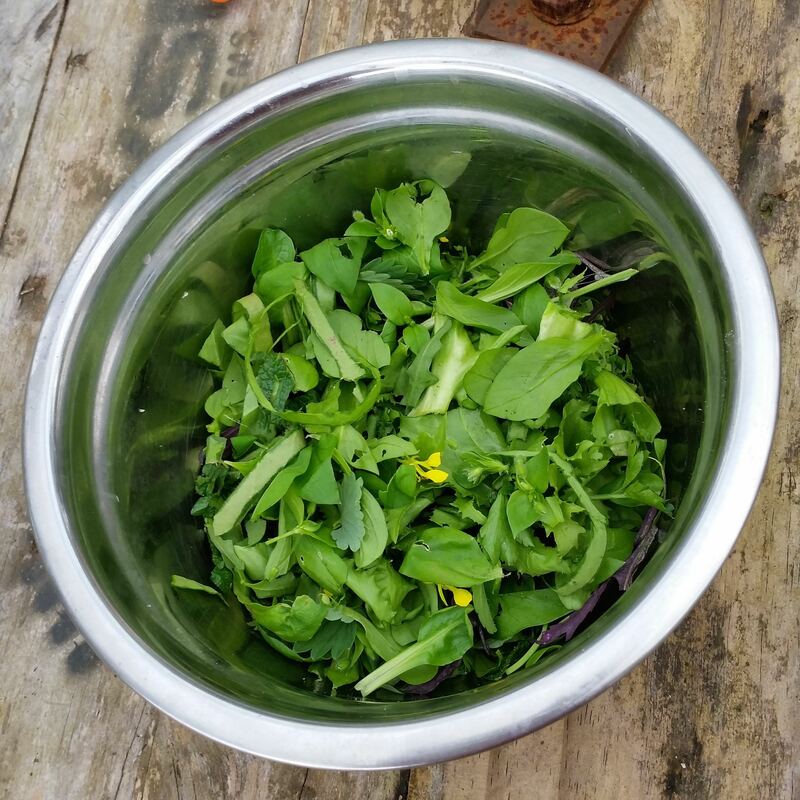 In Auckland we can have lettuce ready at this time of the year but in the south, in early spring, I would rely on other not so well known salad greens that can take cooler growing conditions like curly endive, miner's lettuce or corn salad. 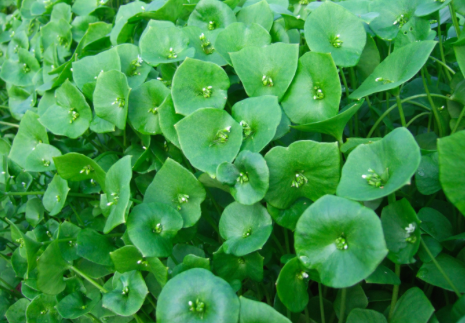 Miner's lettuce Claytonia perfoliata is also called winter purslane as the leaves have the same slightly succulent texture as purslane. Miners lettuce got it's name because early gold miners would plant it wherever they set up camp. Mineers lettuce would provide them with much needed vitamin C at a time of year when there were little other fresh greens available. It's a plant that's wild at heart, grows quickly and will easily self sow. While not a perennial, as such, it is a good addition to a perennial kitchen garden because if allowed to seed, it will pop up every winter. 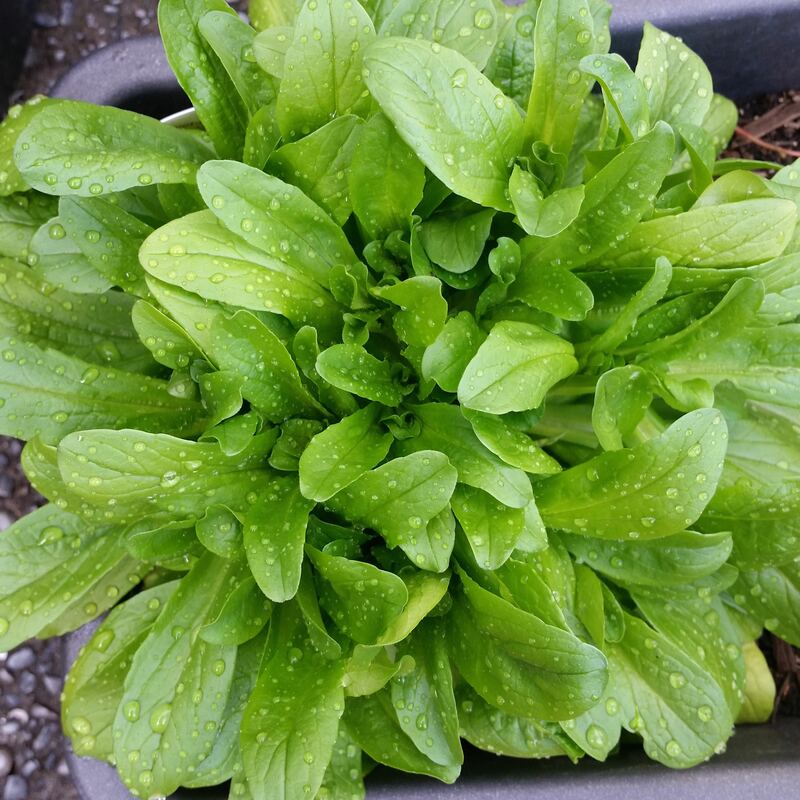 Corn salad Valerianella locusta (also called lambs lettuce or Mâche) is another winter early spring salad green that is mild flavoured like lettuce. It forms a small rosette, and you can harvest the whole plant or simply pick off leaves allowing more to grow. This year I have grown them really well in a pot, doing better than those in the garden, probably because they don't have to compete with larger plants so it's a good option for apartment dwellers. It's important to correctly identify anything you eat, but you are pretty safe to use any vegetable plant that has gone to flower. 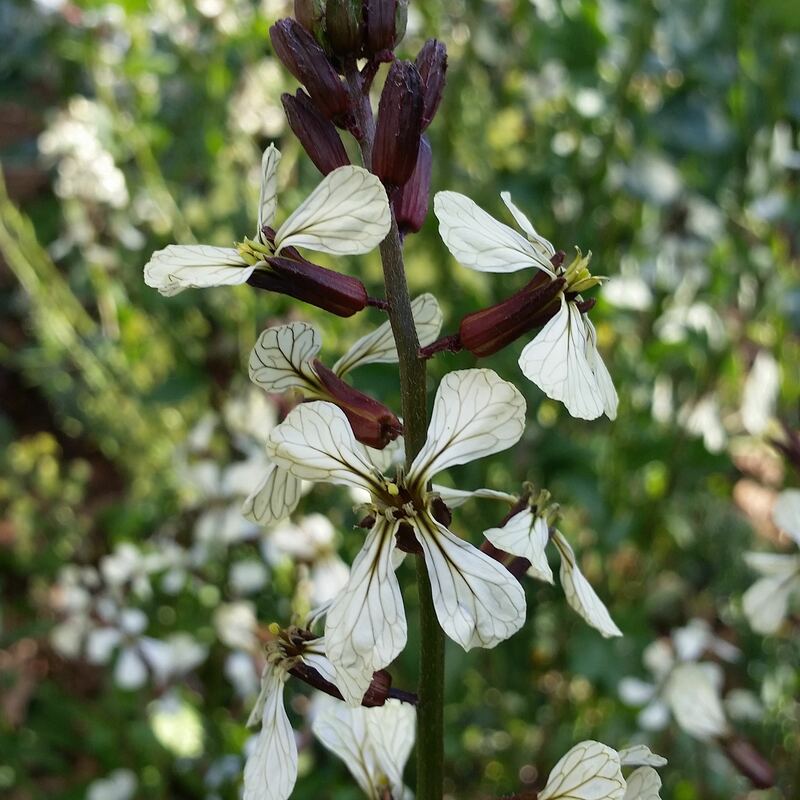 Rocket goes to flower very quickly and the peppery flowers are good to eat. Broccoli, kale, mustards and mizuna all produce little four leaved yellow flowers that can add colour and a mustardy flavour of varying degrees. 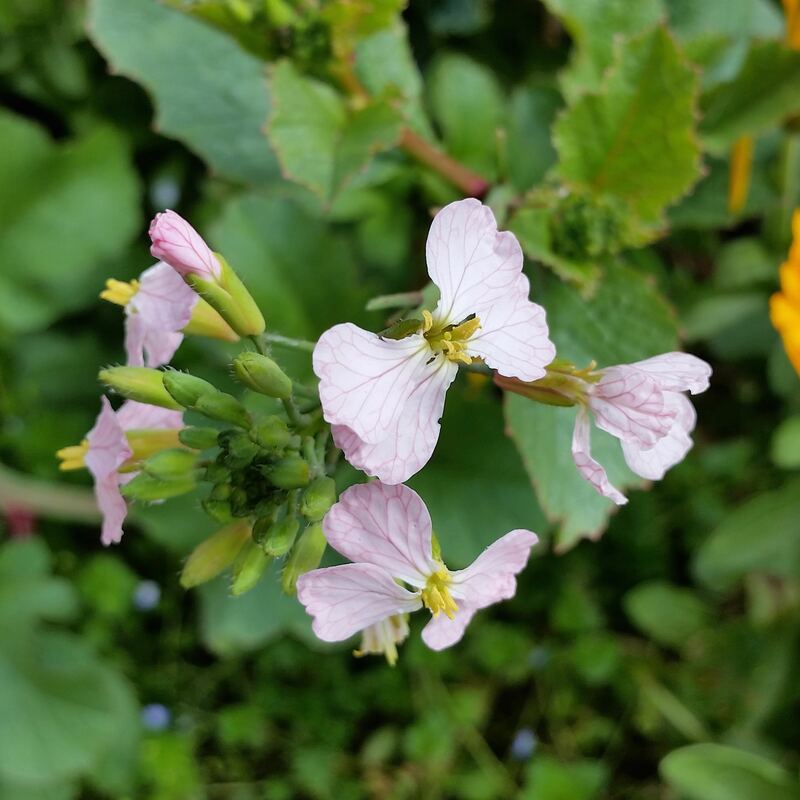 In my garden plot I have pretty pink blooms of a radish that hadn't been harvested so we added these to our salad mix. 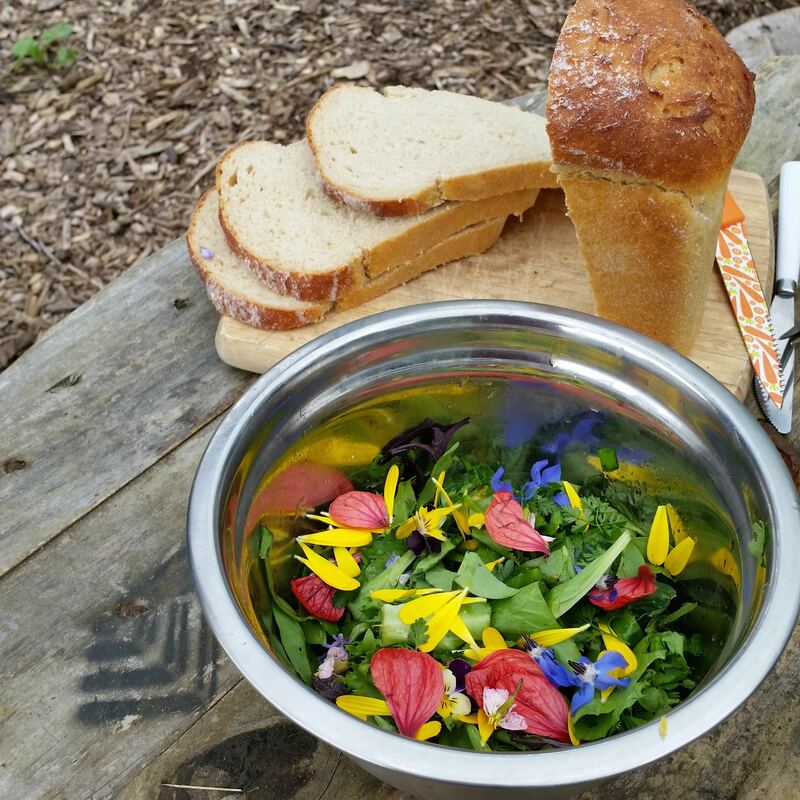 Calendula officinalis is a herb I use in both salads and cooked dishes nearly year round. It's a great little flower to have growing in your garden. It's a perennial but is often treated as an annual and if let to seed will self sow readily. 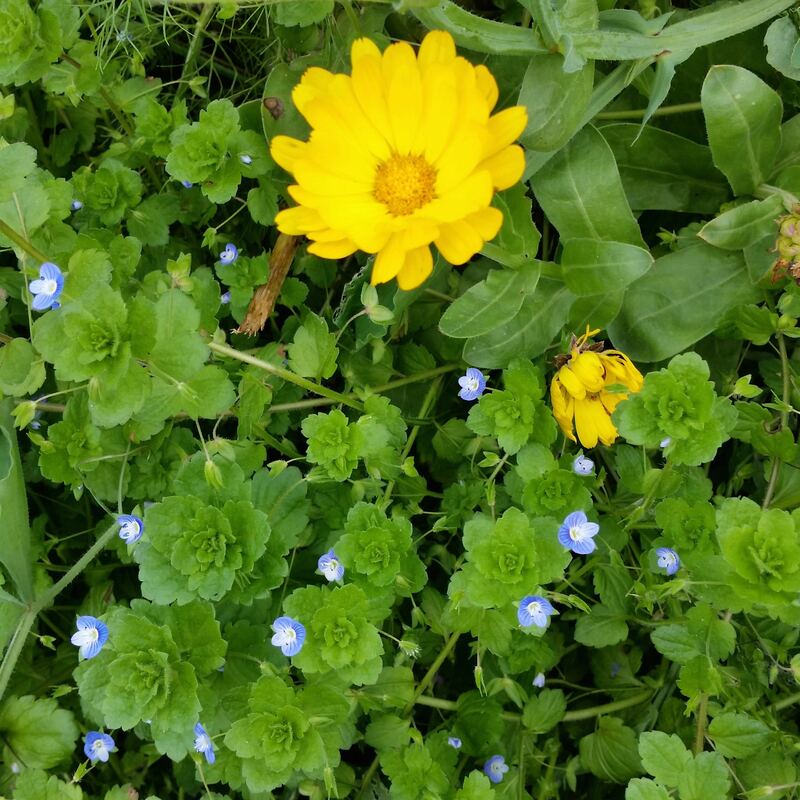 The flowers can be bright yellow or orange and have a yellow centre or a black centre. 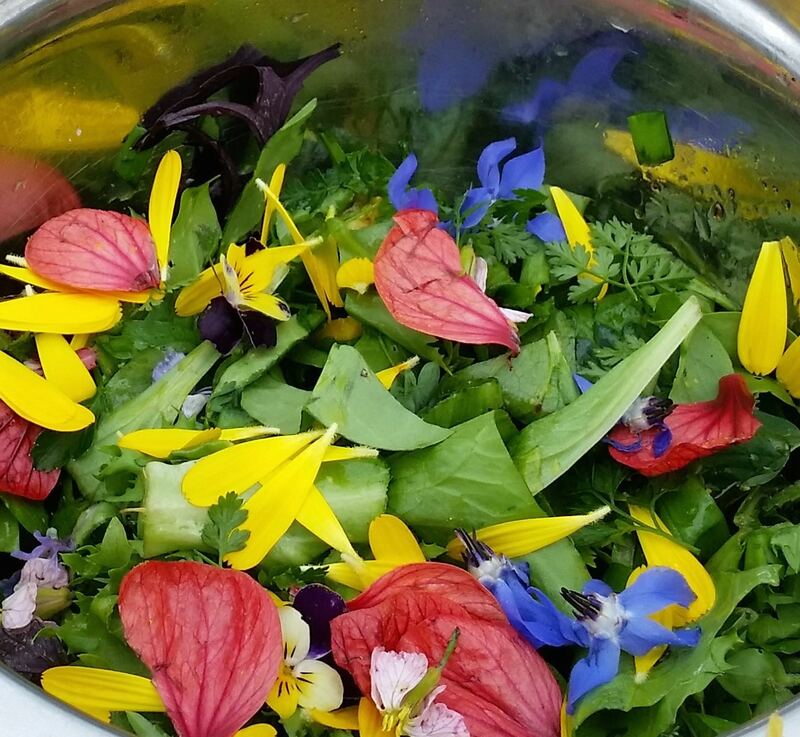 I pull off the petals to add a rich yellow to the green salad. 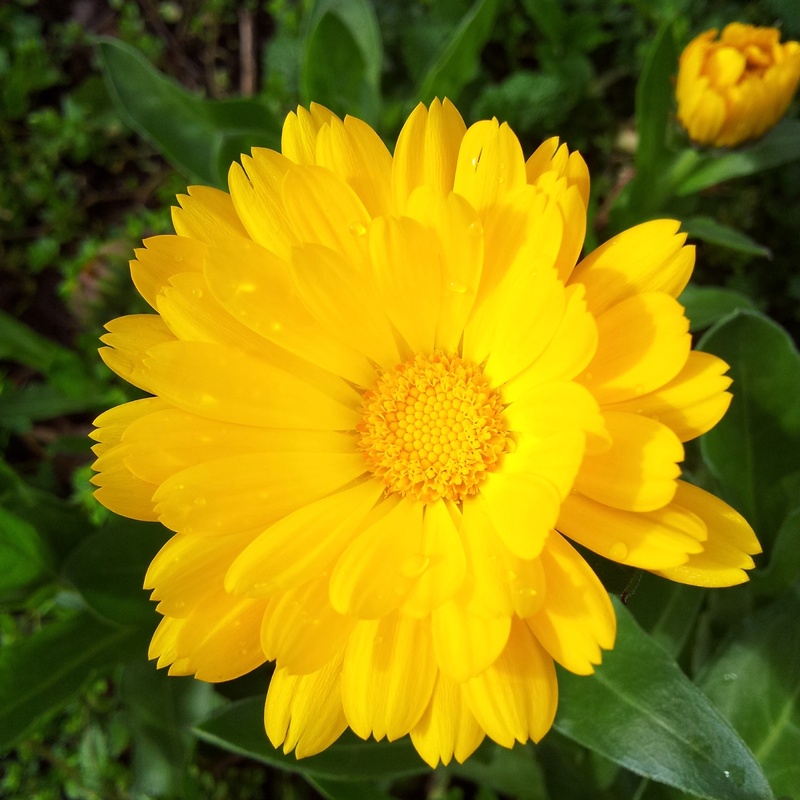 Using Calendula petals does more than just add colour, there are nutritional and medicinal benefits for the digestive tract, liver and gall bladder. Borage is also known as Starflower due to the five pointed petals in a star shape. They certainly aren't star gazers, as they tend to hang their heads down. 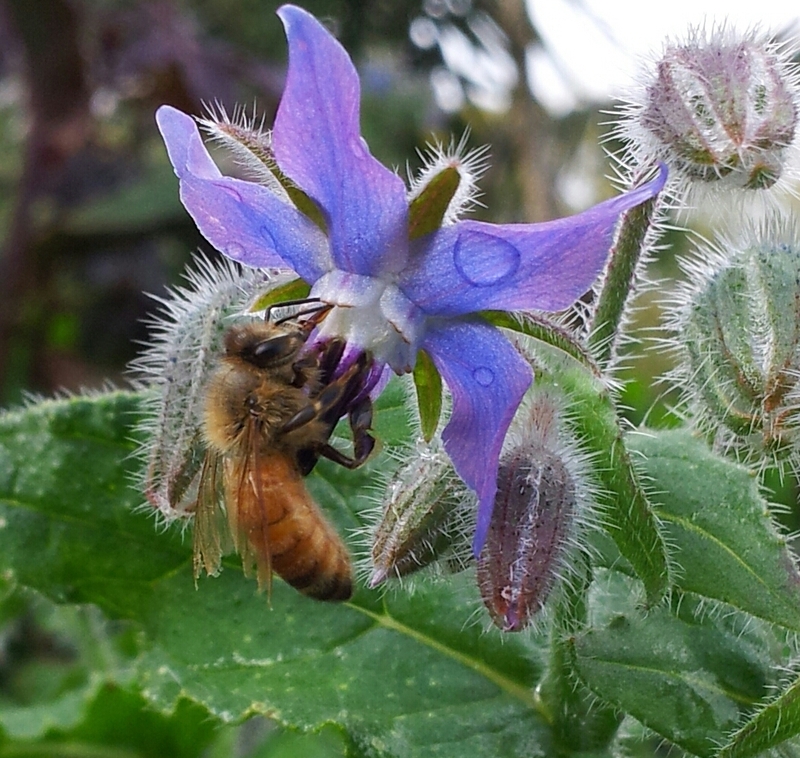 If it's a sunny day you can hear where the borage is by the buzz of the bees. Blue is an intense colour that is noticeable in a salad of green. 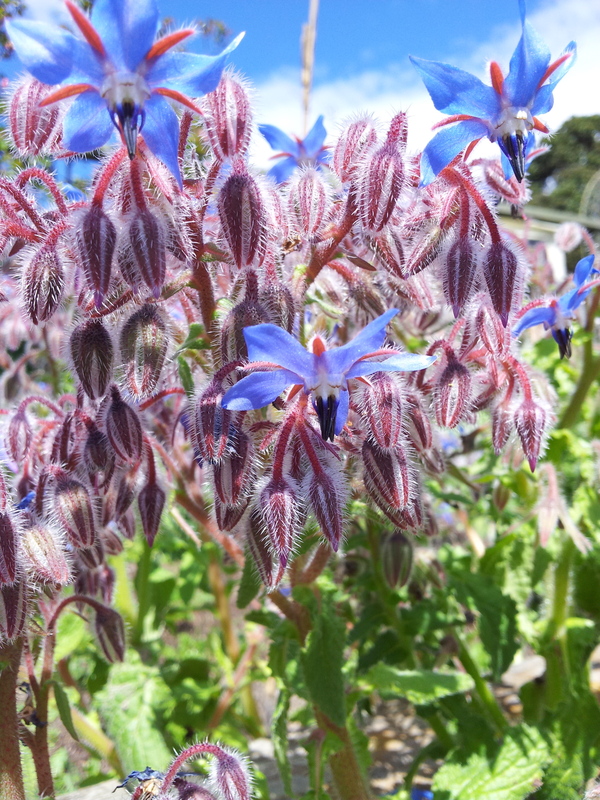 The blue herb Borage, Borago officinalis , with its bright blue star shaped flowers is a real favourite of mine, as well as with the bees in the garden. It's supposed to be a good companion plant for legumes, strawberries and tomatoes although don't interplant as borage does get quite large and gangly as it gets older. It's best planted at the end of a row or in a corner near the plants you want it to companion. If transplanting get the seedlings into the ground when small as they don't easily move due to their taproot. 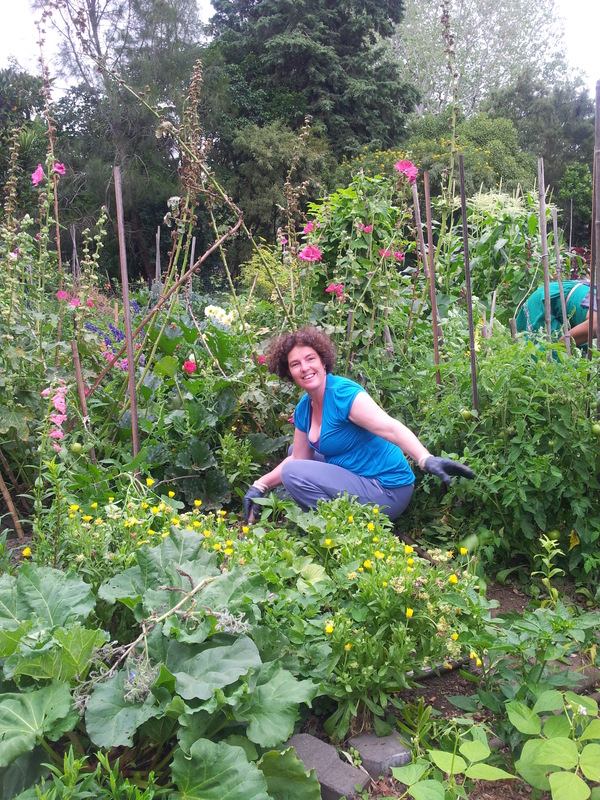 Best to scatter some seeds in the area you want them to grow and if you let them seed then there will always be borage. Borage is often used in ice blocks to decorate summer drinks. Borage has medicinal qualities and has been used since ancient times to dispel melancholy and to induce euphoria...and we can all do with that from time to time. 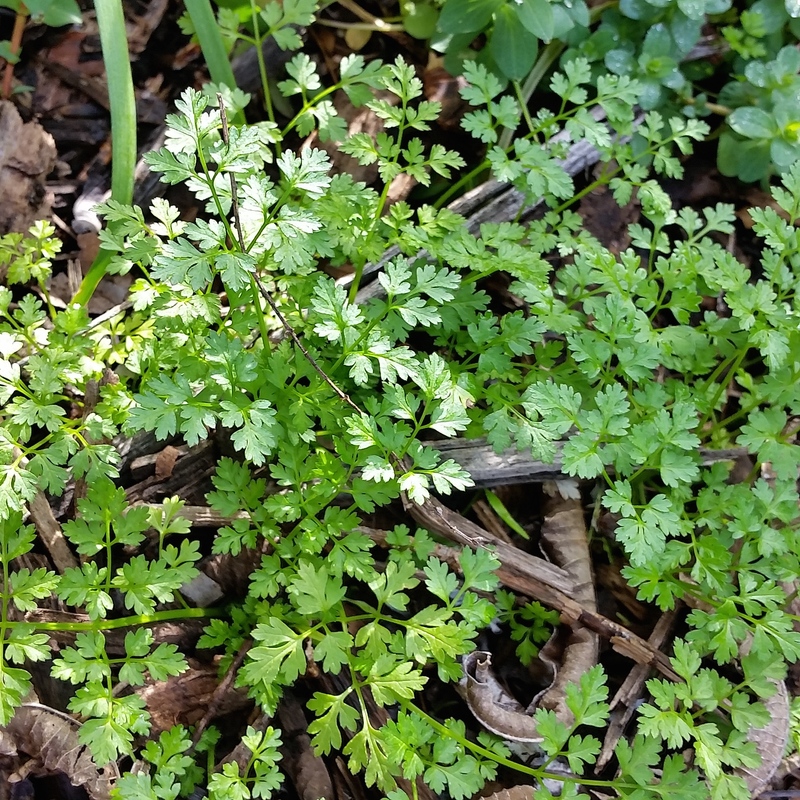 Chervil, like coriander, will remain longer without going to seed if it is grown with the help of some shading from a taller crop. We've had trouble establishing it in our community garden because of the heat and dryness. We have found a safe place for it under the lemon verbena tree and hope it will self sow and spread. We collected from the herb garden a few sprigs of my favourite salad herb, chervil. 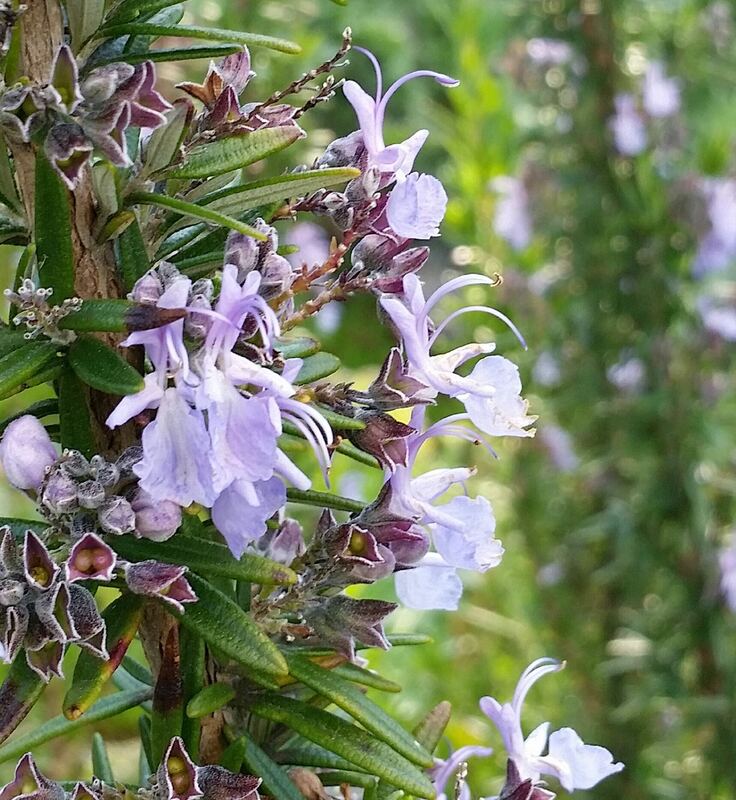 This delicate herb is a good one to get growing in your garden. 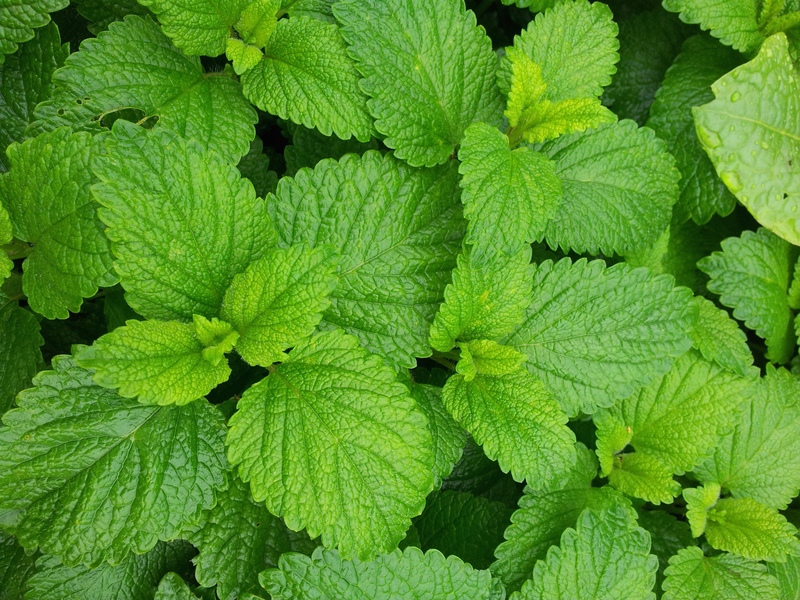 It's in the same family as parsley but has a more delicate flavour with a faint taste of liquorice or aniseed. It has good digestive properties but its not always easy to grow. Chervil quickly runs to seed, especially if transplanted because of its tap root so it's best to sow seeds directly. Once it's found it's happy place, it will self sow. When young the poisonous plant hemlock could be confused with chervil, but hemlock has purple spots on its stems and the best check is to crush the leaves and smell before picking - chervil smells of aniseed balls and hemlock of mouse pee. Heartsease Viola tricolour is a wild flower herb that has been bred to create the pansies and violas in flower gardens. Heartsease is the bearer of a host of other common names: heart's delight, tickle-my-fancy, Jack-jump-up-and-kiss-me, come-and-cuddle-me, three faces in a hood, love-in-idleness and kiss-her-in-the-buttery, to name a few. All these old names indicate what this plant was traditionally used for - to ease complaints of the heart and as a love potion. The flowers were also made into a cordial to help children with coughs and to repair skin conditions. I did find it difficult to establish from seed but it's growing really well scrambling over rocks at the front of my garden plot. It's really an annual but it's now in its second year and blooming it's heart out. I have noticed ants around these rocks so I'm hoping they will help to establish new heartsease. The flowers are soft and of little flavour but they are a show stopper on the plate...and then there's that intriguing notion of it's love potion power. Abutilon is in the mallow family with common names velvet leaf or Indian mallow and needs a subtropical or tropical climate. In southern regions an alternative could be day lilies Hemerocallis as they are also edible and have a similar taste to abutilon. 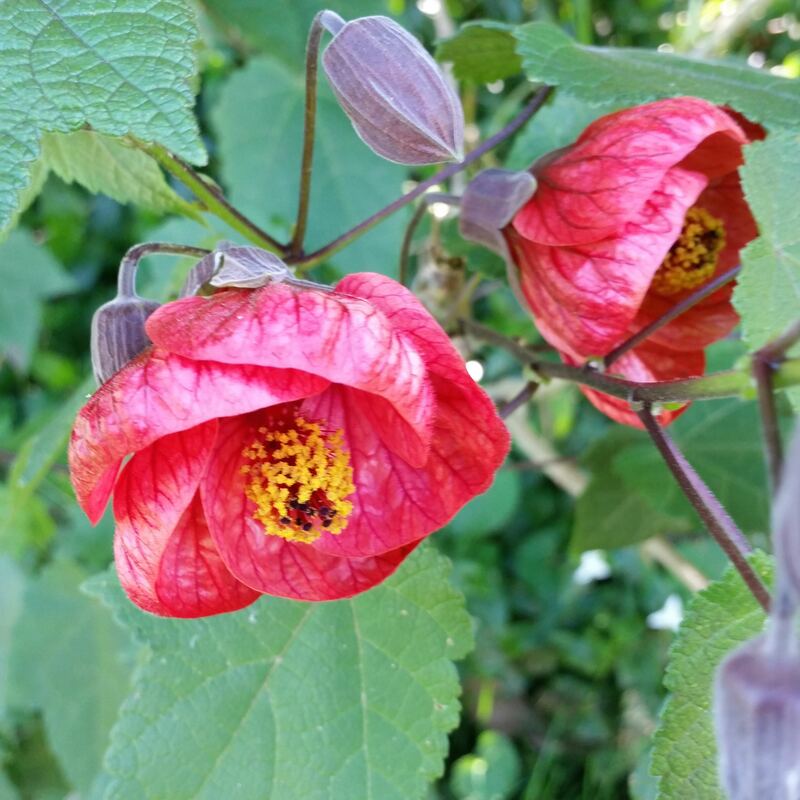 Abutilon tastes even sweeter than a courgette or pumpkin flower. It's velvet soft texture makes this flower easy to eat. The lovely Violet was my Mum's favourite flower so I always have a soft spot for it. Shame really to eat something that does such a good job perfuming the air. 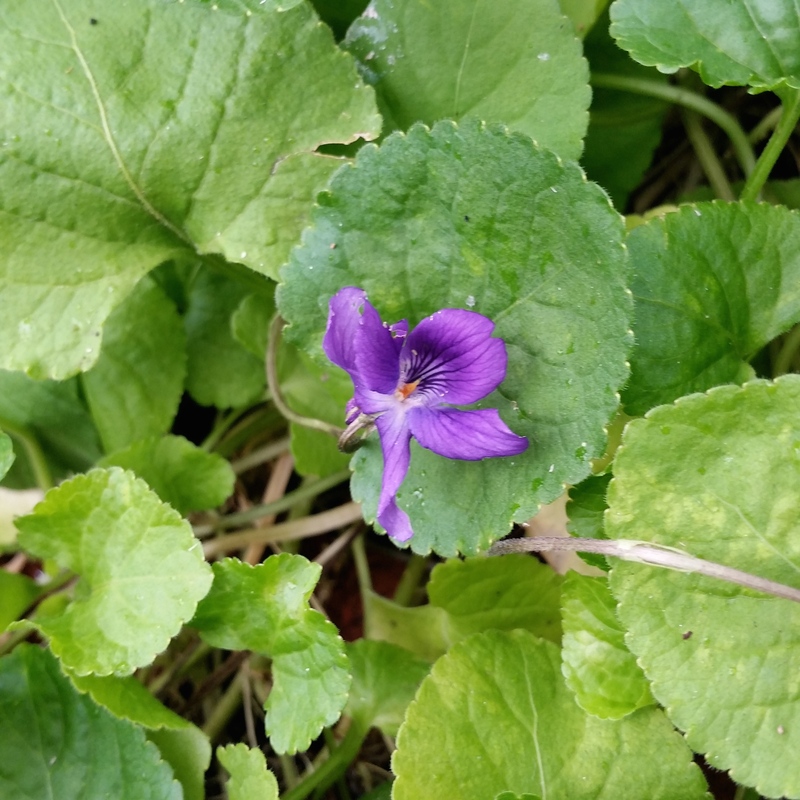 Violet Viola odorata's sweet flower matches it's sweet perfume. They are particularly lovely placed on desserts but I also like them included in a salad. You can eat the leaves with two leaves having as much vitamin C as an orange. The flowers heated in sugar and water will extract a floral scented syrup to use in desserts. 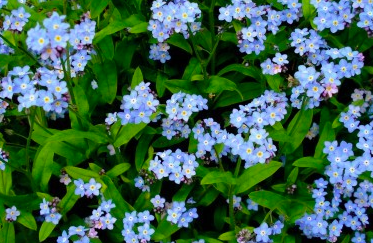 At lunch I was asked if forget-me-nots Myosotis scorpioides were edible. I didn't have the answer then but have since discovered they too are in the borage family, and yes the little blue flowers are edible.